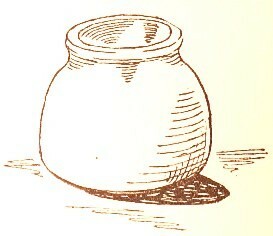 An alternative rendering of one of the Upton 'sound jars'. 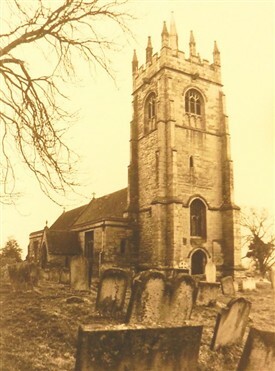 When the chancel of Upton church was rebuilt in 1863, six rough earthenware pots were found embedded in the walls of the old structure. The pots were placed three on each side at intervals of about 6ft, and about 7ft above the ground. The mouths of the pots faced outwards, and were covered in plaster making them invisible prior to the demolition of the chancel. One such urn was, however, preserved intact by the incumbent. Each urn was pale red and 9.5 inches high. Circumference at the base was 36inches, and 26 inches at the neck. Strange though the circumstance may be, as soon as they were unearthed at Upton the purpose of the urns was quickly identified. 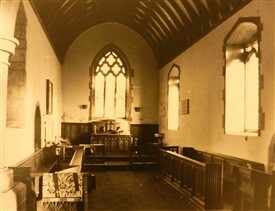 They were intended as a system for sound enhancement within the church - to increase volume or improve the acoustic resonance of singing and chanting. In pre-microphone and amplifier days it was a well-known method of sound enhancement for large buildings, having antecedents as far back as ancient Greece and Rome. 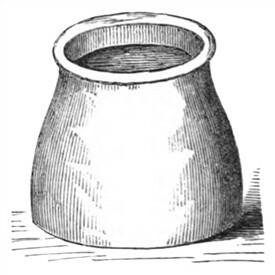 It is well known that vases and pipes of earthenware were used in the construction of the domes and vaulted ceilings of ancient buildings with the same view. There is no doubt that these methods of increasing the effect of sound were well known to our medieval architects, and were no doubt handed down to them by their earlier brethren among many other secrets of the craft...."
Writing in the book "Antiquities and Curiosities of the Church (edited by William Andrews, London, 1897, pp34-43), George C. Yates records examples of acoustic jars being discovered at the following locations around the UK:- Fairwell in Staffordshire (1747); Norwich (St.Peter Mancroft, 1850); Norwich (St.Peter, Parmentagate); East Harling in Norfolk; Leeds near Maidstone in Kent (1878); Denford Northamptonshire; Upton near Newark, Notts; St.Olav's in Chichester, St.Clement's church in Sandwich; Luppitt in Devon (1838); at Fountains Abbey in Yorkshire; as well as various places in Scandinavia and Europe. Writing of one of the latter locations - Aries in France - Yates quotes a 15th century manuscript from that place (A Chronicle of the Celestins of Metz, dated 1432) in which the purpose of incorporating such jars within the fabric of buildings is determined beyond doubt:- "It was ordered that jars should be put into the choir of the church of this place, because they made the singing better and resound more". The subject was taken up again — and amplified — by George C. Yates, in Antiquities and Curiosities of the Church (ed. William Andrews), pp34-43. This page was added by Website Administrator on 02/11/2016.